(KHARTOUM) – The joint Sudanese-Ethiopian military commission has agreed to develop a five-year plan including all aspects of cooperation contained in the 2009 military protocol signed between the two countries. In 2009, Sudan and Ethiopia signed a military protocol for a period of three years dealing with the development of the armed forces and ways to secure the common border between the two countries. Last October, Sudan and Ethiopia signed a memorandum of understanding providing to enhance joint security and military cooperation between the two neighbouring countries to fight terrorism. Also, in March 2016 during the 14th meeting of the joint Sudanese-Ethiopian technical committee in Khartoum, Sudan proposed to deploy joint border units on the border between the two countries. 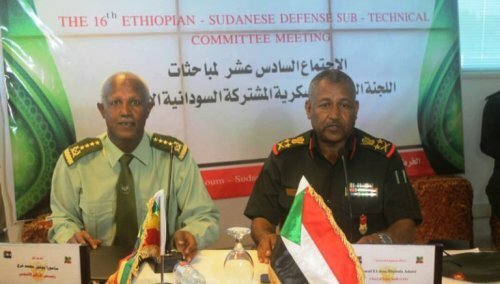 On Tuesday, the joint Sudanese-Ethiopian military commission concluded its 16th meeting in Khartoum. At the closing session, the chiefs of staff of the two armies signed agreements reached. In press statements following the meeting, Sudan’s Chief of the General Staff, Lt. Gen. Emad al-Din Mustafa Adawi said the outcome of the meeting would constitute the “main pillar for the development of military cooperation between the two countries”. He pointed out to the border protection and the joint work to combat cross-border crimes and the negative movements, saying the meeting agreed to develop a five-year plan including all aspects of the 2009 protocol signed between the two countries. Adawi thanked his Ethiopian counterpart Samora Mohamed Yunis and his accompanying delegation, stressing the two sides seek to promote the distinguished relations to maintain security, peace and stability for the two peoples. For his part, Yunis renewed his country’s full commitment to what has been agreed, expressing readiness for joint work to secure the border and fight against illegal activities that seek to compromise the security of both nations. He said the meeting would contribute to transfer relations to a higher level of cooperation in the security and defence fields, stressing the need to exert more efforts to achieve all objectives.